LANCASTER – The University of Antelope Valley Pioneers (8-11; 6-1 Cal Pac) remain tied atop the conference standings with Simpson University after defeating the Bobcats of UC Merced (9-10; 2-5 Cal Pac) on Saturday night, 79-69 in intercollegiate California Pacific Conference men’s basketball action inside the Pioneer Event Center in Lancaster. After defeating the previously undefeated Red Hawks of Simpson University two nights ago to force a tie atop the Cal Pac standings, the Pioneers came out of the gate strong against UC Merced Saturday evening in the PEC, outscoring the Bobcats 45-30 in the opening half en route to earning the win, 79-69, keeping pace with Simpson for command of the Cal Pac. Senior forward Christian Drayton (Lufkin, TX) continued his impressive offensive run by securing a double-double with 25 points; one shy of his season high, and grabbing a game-high 14 boards to go along with four blocks, two assists and a steal. Junior guard Chris Johnson (Los Angeles, CA) added 15 points, four rebounds, three assists, one block and a steal, junior guard Kamal Holden (Los Angeles, CA) scored 14 points and also totaled five rebounds and three steals, and senior guard Hayden Hall (Portland, OR) finished with 13 points and three rebounds. UAV hit 24-of-56 field goals (.429), 6-of-18 three-pointers (.333), 25-of-29 free throws (.862), and outrebounded the Bobcats, 41-29. UAV committed 13 turnovers and stole the ball five times. UC Merced made 25-of-60 shots (.417), 7-of-21 three-pointers (.333) and 12-of-17 free throws (.706) and committed nine turnovers and stole the ball from UAV six times. 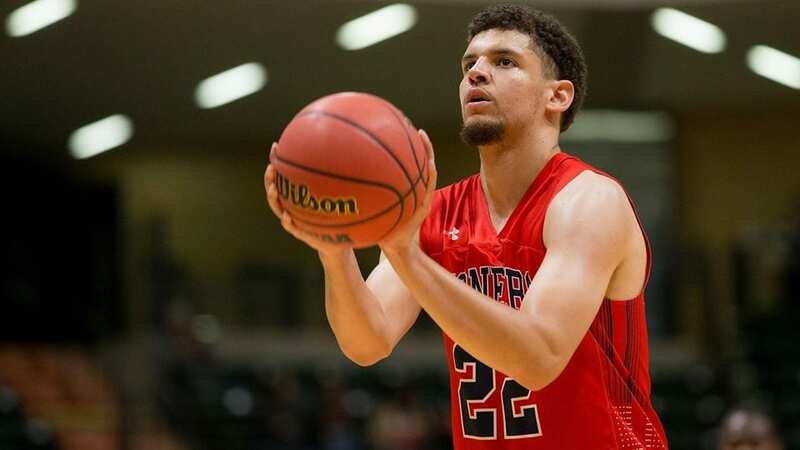 NEXT GAME: Coached by Darwin Cook, the Pioneers remain at home to host La Sierra University for a California Pacific Conference contest on Saturday, Jan. 26 at 8:30 p.m. PST inside the Pioneer Event Center in Lancaster.